Make it easy to order custom printed industrial and promotional products. Offer the highest quality materials. Keep costs low. Generation-ahead technology streamlines orders. Our objective is to delight customers with our award winning on-line print platform and become the leading online supplier of industrial customized products. Personalized print is quickly becoming more than just a three-line, one-color imprint of your company address. Our web software opens up new markets to customization. Our technology is at least a generation ahead of all other market place. Browser-based lightening fast. We build new sites in days, not years. Learn and buy from the experts. See the links to our technology partners. Each site is a leader in their specific market, with a deep knowledge of the technology, rules and the products. Even the best technology fails if the user experience disappoints. Consider ordering a stamp. Most systems present the customer with a bewildering array of stamp sizes, styles and types. These systems take the customer through a complicated, multi-step, painfully slow series of design screens. More intuitive and simpler, we ask what their stamp application is: Bank Deposit Stamp, Name & Address Stamp, Signature Stamp, etc. The customer selects, fills in a field or two and is instantly presented with a spectrum of pre-designed, best-selling stamps. Ordering a stamp should require neither patience nor design skills, just simple answers to simple questions with the designs built in. 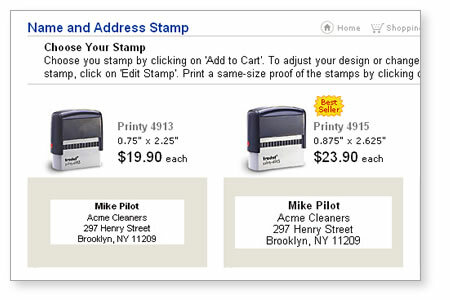 “Line-up” of suggested stamps is shown for easy comparison and that can be printed or even emailed for approval. For many in industrial and promotional printing industry, the promise of Internet e-commerce is still elusive. Expensive sites have been abandoned and many dot-com firms have failed. Yet, we have prospered. Why? The answer can be found in our unique technology and in our unique business strategy. Internet shopping makes it easy to compare prices. The tougher challenge is to compare quality. Our approach is different. By showing the important features for each product, you can make an informed decision. In some cases, we are the manufacturer. In many others, we actually let you choose from a variety of best-of-class manufacturers. You are in control. You decide. Make it easy to look at delivery dates, prices and features. With a dizzying array of competitive web sites out there, all with conflicting claims on durability and quality, it is inevitable that customers are confused. We cut through the clutter. Offer only the best materials for each price point and delivery option. Rather than have to dissect a cluttered mail order catalog clutter of undifferentiated products, we make it easy for you to quickly determine the right product. We know that a smart customer is a good customer. The more you know about the product – the better! With our online help, our tutorials and our hints, you too can easily become a true expert. On the other hand, no amount of online help will make up for a personal contact. Our inside sales staff is truly expert, with deep experience in the relevant customized product. Our goal is to develop Web-enabled relationships, not Web-presented / me-too products. Whether we are giving you tips on how to install a tag, choose the right bar-code symbology or pick the best outdoor ashtray, we have the most extensive guides in the market. In many of our markets, regulations and laws are constantly changing. Few companies can match our in-house expertise. There is a premium placed on product expertise and regulatory knowledge. Naïve users need to feel confident in regulatory sophistication. We have members of our staff that have been elected to chair or asked to regularly contribute to numerous ANSI, Security, Traffic and Parking committees. Our technology started in the 1980s with a BBS – a bulletin board system. The system, LabelBase allowed customers to input variable information which our software woud then turn into a Postscript format along with a primitive online proof back to the user. 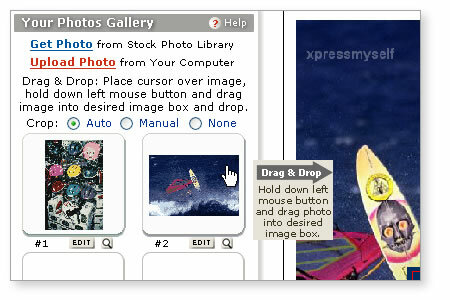 From these primtive beginnings, by the 1990’s the XpressMyself technology became fast and efficient. There are no applets to download. There are no programs to learn. And, you don't have the inevitable slow-downs when competitive systems are overwhelmed with uploading and downloading large files from multiple customers simultaneously. Text and graphic changes are seen in REAL TIME. We avoid the need for the user to make multiple round-trips to the server. As a client-based system, we have access to the ever-expanding set of tools built into your browser. Our award-winning technology is a generation of others marketplace. Browser-based = lightening fast design. Tools for Beginning Users: spell check, automatic word wrap with shrink-to-fit / enlarge to fit, vertical alignment of text, searchable photo library and more. Tools for Power Users: complete DTP environment, photo manipulation tools (contrast, brightness, red eye), upload of complex database files, company-specific logo files and permissions and more. “Where the $X?+! is my order?”. In this case, our system shows the order as it moves through the factory and then, upon shipment, gives the customer the UPS tracking number. We also make it easy to reorder your item or use your same personalized text or photo to design another product. The customer may even track the print order through the printer’s factory. Our system also gives the customer the UPS tracking number. From there, a customer can gladly do their own legwork. Reorders also are a snap. We can use your data to help design another product, too. For example, use your logo on a mailing label or a parking permit. Understand that the web flattens sales channels. Price comparison is easy. As a result, it is very difficult to survive if your prices are too high. Our companies have thrived, whereas others have faltered. Why? Our focus on streamlined online ordering, together with links to the factory floor, mean that we can offer terrific pricing. Note that the “soft costs” for order entry, purchasing and tracking are significant . These costs can represent over 20% of the cost for a custom job. We are not burdened with the costs of expensive mail order catalogs. Have you ever been the victim of "Catalog Carpet Bombing"? Some customers in our markets may even receive 24 catalogs in the mail each year. It is easy to imagine that we have significant pricing and costs advantages – which are passed onto you. The factory may print out a detailed Work Order Specification for your order. This saves money and results in fewer errors. This sure beats a fax. By avoiding the costs of mailing and producing heavy catalogs, we have elected to market efficiently online and save customers money. The products are the same. Your costs are lower. We even offer many free printing services – including the ability to print your own signs directly from one of our sites. You can be your own sign maker! Personalized print is much more than just a three-line, one-color imprint of your company address. ID Badges, Custom packing tape, Tabs, Presentation Folders, Signs ... our companies offer a broad range of customized products. We create sites that are built around the customer's experience first. The internet euphoria over print customization has passed. It is time to get back to what works. Dot-Com Euphoria. Then Bust. Steady Increases in Online Sales. Limited Sales. Online Hype Becomes Real. Finally. Technology High-Flyers Rule. Printer-Centric Solutions. Customers in Control. Finally. Clumsy Interface. Easy to Use Wizards; Custom Imprint Driven by Industry Niches, Not Generic Products. 1-Time Orders. Traffic not Customers. Re-Orders and Cross-Sells. Personal Logo and Photo Library are Valuable Resources. Simple Clip Art. Color Photos (digital photography ubiquitous). Office Products (Business Cards, Stamps and a Few Labels).. Industrial and Promotional Products, too. Generic Customer Service. Inside Sales with Deep Product Knowledge. Single purpose wizards are faster and more intuitive. Unique logic is built into each (i.e. the dating stamp wizard has a different flow than found in the check wizard). The naive user is not overwhelmed by options. But, the power user has complete control over the design. Wizards reflect a true understanding of each customizable product and do not represent a “formula” approach to all personalization. There are hundreds of different kinds of labels. Some are straight-forward templates – such as mailing labels, seals or address labels. Other label projects become quite complex and, traditionally, hands-on CSR assistance is required as the project is quoted and the art file is provided to the label printer. Our label sites, however, handles both. With both ATM-simple wizards for the common label templates and then sophisticated upload and quotation modules for more highly customized jobs, our label sites can do both. XpressNow technology even allows you to print labels yourself, on your own printer. 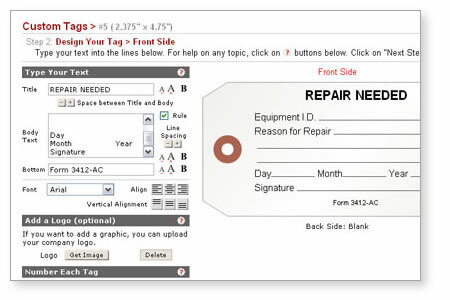 Our wizards allow you to design your own single-sided and two-sided tags, without going to the expense of going to their art department to design the tag form. Ruled text for hand-written text is automatically shown. It is easy for the end user to write on the tag in the field. It is easy to compare plastic and paper tag materials. Or, order some tags with your same design in plastic (for outside use) and then paper (for lower cost, inside-the-warehouse use). Show pride in your firm. 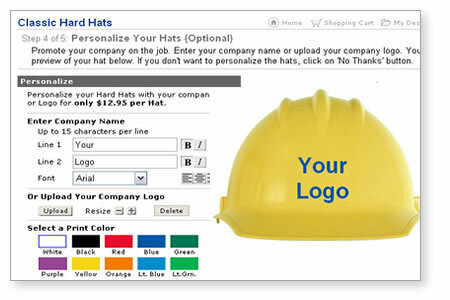 Custom hard hat and hard hat sticker wizards make it easy to change colors, personalize a template or upload your logo. Online selection guide makes choosing the right hard hat easy. Also order hat suspensions, hat liners and even hat racks. 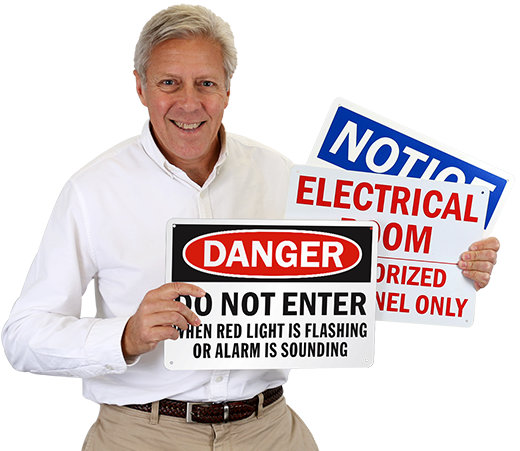 Online sites are available for Warning Signs, Braille Room Signs, Engraved Corridor Signs and Nameplates, No Parking signs and magnetic Truck Signs. It is easy to compare materials. User has quick access to online help written by experts, state-of-the art symbols. 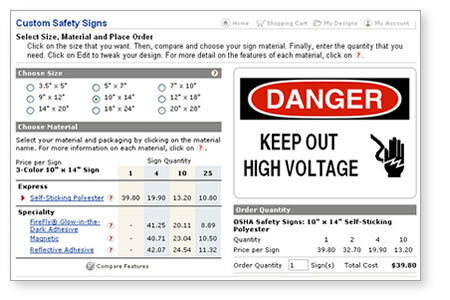 Warning sign wizard makes it easy to design a sign that complies with regulations. Our technnology is fast. There are no applets to download. There are no programs to learn. And, you don't have the inevitable slow-downs when competitive systems are overwhelmed with uploading and downloading large files from multiple customers simultaneously. Text and graphic changes are seen in REAL TIME. We avoid the need for the user to make multiple round-trips to the server. As a client-based system, we have access to the ever-expanding set of tools built into your browser. XpressMyself offers superb text-handling capabilities. Unlike competitive technologies built around traditional prepress software and complex file structures, XpressMyself starts with the consumer, open file structures and the power of the browser itself. The browser experience comes first. Virtually unlimited scalability both upward and outward. Our calendar sites (now owned by Electronics for Imaging) were some of the highest trafficked sites on the web during the holiday seasons. XpressMyself built the calendar sites for Kinko’s and OfficeMax, for example. There is no need to be an artist. Just grab the photo that you want and drag it into your design. Your image is automatically cropped and automatically aligned. Automatic No-Crops for Silhouetted Photos. Can be used for logos, photos or graphics. Shrink-wrap label software can be a pain: you have to purchase and install it, you clutter your hard drive with unnecessary clip art and you have to learn yet another program . XpressNow represents the easier alternative. Create address labels, business cards, namebadges, even warning signs and greeting cards online. With easy-to-use, templated product offerings, XpressNow allows you to upload your own database and print labels on your laser or ink jet printer. Avery® Templates Built-In. Common address and mailing label formats are pre-set. Easy Uploads. Use our “starter” XLS file or build your own database online. Easy Margin Controls. Intuitive interface allows you to tweak your sheet margins. Produces convenient PDF or DOC files. 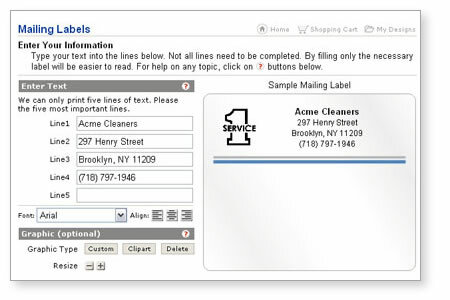 LabelSaver online software allows you to print only a partial sheet of labels. Click on the label position (the row and the column) and your labels will start printing from that position. Start printing labels on the sheet where you last stopped. 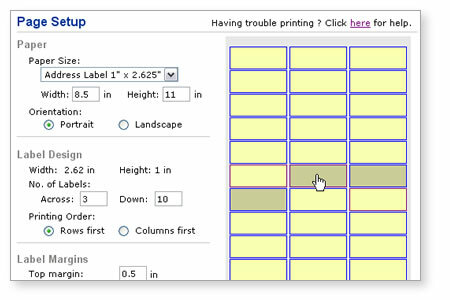 Users can even specify if they want to print columns first or rows first. Print files can be produced that only show the variable black printing. This way, the customer can see a full color design, but only print the personalized black portion on pre-printed colored blanks bought in advance. 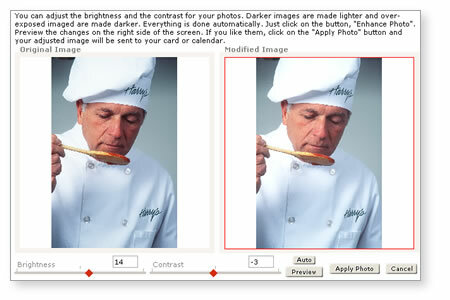 We offer a full suite of photo editing tools, including contrast control, brightness and red-eye reduction. Adjustments can be made using our intuitive “slider” bars. Photos or graphics can be resized or cropped using our corner “Grabbers”. Images can be flipped or converted into a negative or positive form. The customer can perform simple or Boolean searches and quickly find professional photography. For even faster look-ups, the most popular photographs are also sorted by business types (Legal Firms, Landscapers, etc.) and by theme. Convert color photos or logos into duotones or monotones. Ghost logos so that they float over a security background. Complete PMS control over converted logos. Easy uploads of graphic files. How many signs have mistakenly printed “Unauthorised Personel Only, Tresspassers Keep Out!”? XpressSpell helps to catch these mistakes before they become embarrassing re-runs. Unique dictionaries can be added. How do you make simple text look good? For years, this has been a task for Graphic Designers. Our online tools, however, automate much of the design process. By taking the same rules used by generations of designers and then applying them, automatically to your text, we have created a break-through in design. These tools are as simple as those that “shrink-to-fit” or “enlarge-to-fit” text into the available space. Other libraries define the complex rules regulating word wrapping, vertical alignment of grouped text, font size and leading. We take these libraries and apply them to each design, thereby eliminating the need to painstakingly tweak a design online. And, remember, that our designs are shown “live” and do not require a trip back to the server. Grouped text blocks with different font sizes. Design Hot-Spots linked to text editing. Controlled Movement (restrict, for example, only X or Y dimension shifts). Automatic Ruled Text (for tags and write-in labels).